One of Mr. Lunn’s most celebrated cars was the experimental Mustang I, a two-seat, four-cylinder aluminum-bodied sports car with its engine midway between the front and rear axles. It was unveiled in 1962 and later became one of the most popular of the sporty, compact so-called pony cars. Mr. Lunn oversaw development of the engine and chassis. “It had a very interesting reception,” Mr. Lunn told Hemmings Classic Car magazine in an issue published this year. “There were a lot of people who said they wanted a sports car. But when you looked at the market, two-seaters didn’t sell well. It was one of those things where people said they wanted them but didn’t actually buy them. In 1966, GT Mark IV models finished first, second and third at Le Mans, ending Ferrari’s six-year streak of first-place finishes. The engineers returned to the drawing board and solved the aerodynamic challenges within two years. 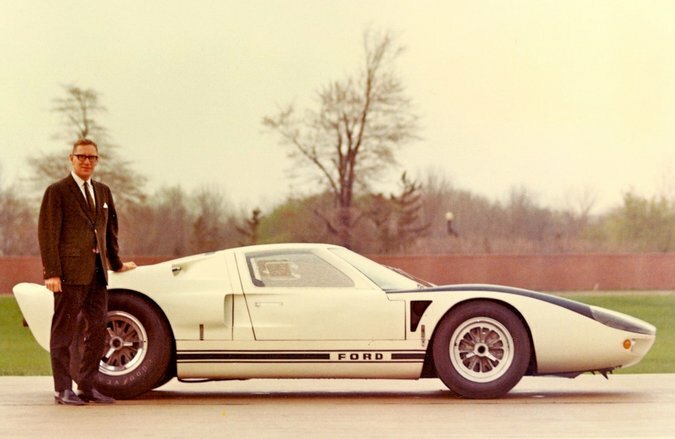 Roy Lunn with a Ford GT40 in an undated photo. Mr. Lunn also helped design for Ford a virtually impregnable Lincoln presidential limousine, one that could withstand not just gunfire but also poison gas and exploding projectiles. And he came out of retirement to help perfect the muscular Humvee to meet the Army’s specifications. That vehicle became a workhorse means of transport for American troops in the Gulf and Iraq wars. Royston Charles Lunn was born on June 26, 1925, in Richmond, a London suburb, to Ernest Lunn, a printmaker, and the former May Winslet. When weekday classes were suspended because of German bombing raids during World War II, Roy worked as an apprentice tool-and-die maker. When he was 18, he joined the Royal Air Force and was assigned to a turbojet engine design project. After the war, he graduated from Kingston Technical College (now Kingston University) near London with degrees in mechanical and aeronautical engineering. Beginning in 1946, he worked at A.C. Cars and later at Aston Martin and Jowett until 1953, when he joined Ford of England. Mr. Lunn immigrated to the United States in 1958 and became the head of Ford’s Advanced Concepts Group. He left Ford in 1969 to join one of its contractors, Kar-Kraft, where he supervised production of the high-performance Boss 429 Mustang. In 1971 he was recruited by American Motors Corporation (later part of Chrysler), where he became technical director of engineering for Jeep. When he retired in 1983, he was chief engineer of AMC and president of Renault Jeep Sport. His retirement was short-lived. In 1985, the heavy-vehicle manufacturer AM General asked him to be its vice president for engineering, with a mission to help its Humvee (High Mobility Multipurpose Wheeled Vehicle) meet the Pentagon’s standards. Mr. Lunn raced sports cars in his 20s. In 1952 in Britain, he and the French driver Marcel Becquart won the Royal Automobile Club International Rally. Later, living in Michigan, he drove the Mustang sportsters that had evolved from the 1962 prototype. His personal car was a Mustang for years and later a Cherokee. The last car he owned and drove was a fuel-efficient hybrid electric Toyota Prius. After Mr. Lunn retired in 1987, he wrote three books: “The Oil Crisis: Sooner Than You Think!” (2004), “Globalization — A Worldwide Quest For a Sustainable Future” (2008) and “The World Crisis — It All Started With 9/11” (2009). He was inducted into the Automotive Hall of Fame in 2016. He is survived by wife, the former Jeanie Darby; his daughters, Nicola and Patrice Lunn; two granddaughters; a great-grandson; and his sister, Audrey Lyon. Mr. Lunn remained a visionary into his last years. When he died, though he acknowledged that it would take decades to develop, he was working on what he called a “People’s Car”: a three-wheel electric vehicle manufactured entirely from sustainable materials, like compressed sawdust. His suggested retail price: $5,000.